I had a call yesterday from Wellington’s Dominion Post newspaper needing an expert to identify some fish found washed up on the Petone foreshore. 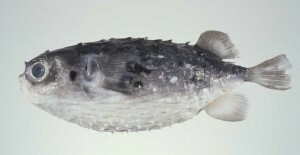 Andrew Stewart, Te Papa’s fishes collection manager, identified them as porcupine fish. Porcupine fish Allomycterus pilatus, NMNZ P.35109; 185mm SL. Photo: A. Stewart, Te Papa. Andrew says that the porcupine fish lives around in-shore reefs, especially along our northern coasts where divers commonly see it underwater. Most specimens are captured accidentally by dragnets or found dead on the beach, but occasional specimens are caught by recreational anglers. 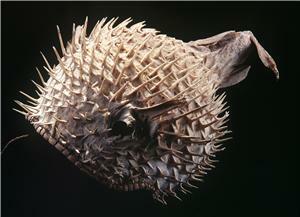 Porcupine fish are related to pufferfishes, and have a similar ability to blow themselves up like a ball by swallowing water (or air), which makes the spines stand out erect from the body. Though this makes it hard for predators to swallow them, Andrew says that he has found porcupine fish in the stomachs of long-snouted lancets. The toxin common to the fish in this family is tetrodotoxin, a neurotoxin that can cause paralysis and death in a very short timeframe. This has also been found in sea slugs found recently on Auckland’s Eastern beaches and was reported to have been the cause of death of two dogs. So heed the warning and DO NOT TOUCH! We have specimens of porcupine fish in Te Papa’s collection but, for me, the most intriguing is the puffer fish helmet in the Pacific collection. Puffer fish helmet, 1900s, maker unknown. © Te Papa. The helmet is part of a war costume from Kiribati and was collected by Albert Ellis and his wife in the 1930s and gifted to the museum by their grand-daughter. A warrior kitted out in this would have made a fearful sight, but the helmet wouldn’t have given the wearer much protection against weapons like these! Rere (hand weapon), maker unknown, Kiribati, part of the Oldman Collection.© Te Papa. See more of Te Papa’s fish and Pacific collections on Collections Online.